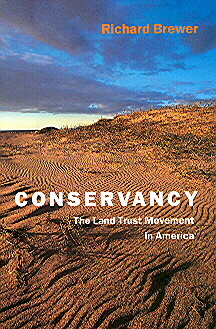 Conservancy: The Land Trust Movement in America is the first book to provide a full treatment of the land trust movement. Although the earliest land trust was formed in 1891 and around 1700 land trusts now operate in the United States, no other source gives the general public–or land trust practitioners–an overview of the land trust movement. I felt the lack of such a book keenly when I was one of several concerned citizens forming the Southwest Michigan Land Conservancy in 1991. 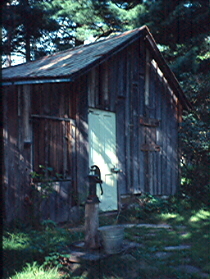 Conservancy can be purchased from the publisher, the University Press of New England. It is also available from Amazon.com and other booksellers. Introduction: Saving Land the Old-fashioned Way: The land trust model of private land protection is distinguished from protection by government and the actions of land advocacy organizations. History: Development of the land trust movement from the founding of the Trustees of Reservations by Charles Eliot to the 1981 national meetings that gave rise to the Land Trust Alliance. Sprawl: The rapid loss of natural and agricultural land to development has brought many people to the land trust movement. The root causes of sprawl need to be attacked, but in the meantime land trusts are battling sprawl on the ground, parcel by parcel. Why Save Land? A thorough treatment of the aesthetic, practical, and ethical reasons for protecting land. Who Will Save the Land? Many individuals, organizations, and agencies own land that is supposed to be protected in perpetuity. Case studies where protection has failed suggest that land trusts are the best bet for permanent protection. Choosing Land to Save: Saving almost any type of real estate from development will have environmental and societal benefits, but working from a foundation of principles derived from ecology and conservation biology will be most effective. Stewardship: Conserving land involves not just acquiring it but also taking care of it. Approaches based on science and experience are described. How to Save Land: Discussion is focused on the main ways of protecting land–purchase or gift of title and purchase or gift of conservation easement. Defending Conservation Easements: Although the conservation easement approach of acquiring rights to land rather than outright ownership is a flexible tool, many actual and potential threats to the stability and durability of conservation easements exist. These are discussed along with possible remedies. The Land Trust Alliance: Formation and operations of the national umbrella organization for the land trust community are described. The Nature Conservancy: This science-based organization is the largest land trust and the one most familiar to the general public. The Trust for Public Land: Another land trust of national scope, TPL is best known for working with local groups to save lands they deem important. These range from large, near-wilderness tracts to small urban plots. Farmland Protection: The American Farmland Trust and two local agricultural trusts (Marin Agricultural Land Trust and the Colorado Cattlemen’s Agricultural Land Trust) are discussed in the context of the troubled American farmland situation. Trails and Greenways: An overview and some case histories of trail establishment; the Rails-to-Trails Conservancy and one local trails land trust (Allegheny Valley Trails Association) are described. A Diversity of Local Land Trusts: Regional aspects of the land trust movement. Capsule descriptions are provided of several land trusts including Kestrel Trust, Rattlesnake Gutter Trust, and Valley Land Fund (all of the Amherst, MA, area), Western Pennsylvania Conservancy, Green Horizon Land Trust (FL), Big Sur Land Trust (CA), Iowa Natural Heritage Foundation, and the Michigan Nature Association. In all, about 70 land trusts are treated in Conservancy, some briefly, some at length. A Cleaner, Greener Land: An epilogue giving eight recommendations for increasing land trust effectiveness. Completing the book are a brief Glossary, documentation in the form of Notes and a Bibliography, and a thorough, 20-page Index. For the cover of Conservancy, I wanted a scene from a preserve owned by a local land trust. The striking image the editors and I chose was by Douglas Steakley, who has since won the Sierra Club’s Ansel Adams award for superlative use of still photography to further a conservation cause. Here is the caption: Late afternoon at Big Sur Land Trust’s Martin Dunes Preserve by Douglas Steakley. These 125 acres near the Salinas River National Wildlife Refuge protect some of the least disturbed dunelands along California’s Monterey Bay. Snowy plovers nest on the beach and several rare and endangered plant, reptile, and insect species live in the dunes.